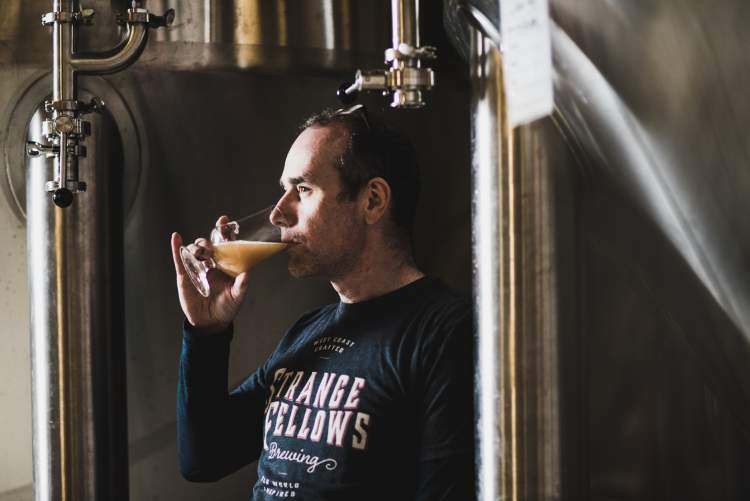 To BC’s current generation of craft beer enthusiasts, owner and brewer Iain Hill might be recognized as one of the brains behind Strange Fellows Brewing Company. His influence on BC’s beer scene, however, runs more broadly and deeply than even longtime fans might know. Iain inherited his early affinity for brewing directly from his father. Back in the late 1970s and early 80s, the senior Hill was conducting partial mashes at home in Maple Bay on Vancouver Island with malt extract, steeped specialty grains and cone hops. The recipes came from Dave Line’s classic book, Brewing Beers Like Those You Buy. Iain helped with the brewing and, of course, the quality assessment. In Canada prior to 1985, one was supposed to seek permission from the Federal Government to brew beer at home. Ingredients were hard to find, other than malt extract “for bread making”. An exponential increase in Canadian homebrewers deciding to turn pro can be traced back to the relaxation of that legislation, along with the gradually expanded availability of homebrewing supplies. Iain participated in collective homebrewing while studying Biochemistry at the University of Victoria. There, Dr. Nano (his real name) sparked an interest in obscure fermented foods. For a while they talked of a spin-off business in the manufacture of Viili, a ropy cultured-milk product from Finland via Sweden. It involves a mixed culture of yeast and bacteria; does that sound familiar to Strange Fellows fans? By 1992, Iain and his then-girlfriend Christine were living above Frank’s Barber shop at 16th and Granville. He was working at Broadway Brewing, a homebrewing and winemaking store with operations in Kitsilano and Dunbar. His bible and cramming notes for brewing jobs was Charlie Papazian’s The Complete Joy of Homebrewing. But learning opportunities would arise that would dwarf any how-to book. Not only was Iain lucky enough to have a brewing father, he was also fortunate enough to work with the two founding fathers of BC craft brewing, John Mitchell and Frank Appleton, at key points in his career. Shaftebury Brewing began operation in 1986 in what we now know as ‘Yeast Van’. John Mitchell was the primary brewing consultant there. Iain started in quality control at Shaftebury in early 1993, after applying for a variety of other jobs in the general area of food biotechnology. Barry Benson, who later became the “B” in East Van’s R&B Brewing, trained Iain in plating active yeast cultures and determining the status of packaged beer. They had a pressure cooker, incubator, and microscope in a closet with no plumbing. Iain really wanted to move into brewing. Operations were expanding, and none of the other brewers were keen to work a late Friday shift, so he volunteered. 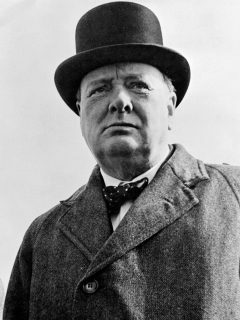 The first beers he brewed included Cream Ale, London Porter and Christmas Ale. (One of the consultants at Shaftebury was Malcolm Farvel of Rogers Sugar which perhaps accounts for the overuse of golden syrup and brown sugar in those beers.) Iain had very little experience in brewing, but that didn’t matter because neither did those around him. The beer was highly variable, often heavy on diacetyl, but it was new and different and sold well to those of us desperate for an alternative to big brewery lager. The dream of operating his own brewery crystallized during his time at Shaftebury, but a lot of wort had to pass through the chiller before that dream came true. One day, in one of those strange twists of fate, a friend of Iain’s overheard a conversation in a coffee shop about Mark James starting up a brewpub. Iain reached out to Mark and arranged a meeting at his Broadway and Bayswater headquarters. He was told to keep in contact. Then a job opened up at Okanagan Springs because Gary Lohin (later of Central City Brewing/Red Racer fame) had moved to Sailor Hagar’s. It was in production and quality control, with a proper laboratory. Iain was offered the position. However, Christine was enrolled at Emily Carr and Vernon seemed far away. Iain passed on the opportunity and kept his fingers crossed for the Yaletown job. He got lucky. Mark James decided, despite Iain’s relative lack of experience, to hire the guy that wanted this job, not just a job. BC brewing legend Frank Appleton, hired by Mark to design the Yaletown brewhouse, trained Iain on his new brewery equipment over a three-week period. Iain relates how Frank phoned up Chris Johnson, brewer at Swan’s (which Frank had set up in 1989) and said “send me my recipes”. The first beers brewed at Yaletown were based on what Swans was putting out, but under different names: Mainland Lager, Northern Light Lager, Red Brick Bitter (yes, they had the temerity to use The B Word), Franks Nut Brown Ale (affectionately known as “Frank’s left nut”), Double Dome Stout, and Indian Arm Pale Ale (not an IPA, just a local reference). Once he got comfortable with the system, Iain soon began to tinker with the recipes. The beers evolved, the names changed, and new beers were introduced. Standouts in my memory were Brick and Beam IPA and Hill’s Special Wheat. One of the first to brew Hefeweizen in Canada, Iain was certainly the first to perfect it. Not surprisingly, that is one of the beers Iain is most proud of. Iain tells how, in 1996, Micheal Leibinger, scion of the Ravensburg brewery family, had been studying ESL in Vancouver and drinking at Yaletown. He got to talking beers with Iain and, next thing you know, a friend of his brought over a liquid yeast culture from Leibinger Heimatsbrauerie. Iain has banked that culture ever since. In 1996, a trip to Belgium came to have a huge influence on Iain’s brewing. He was captivated by the stunning variety and tried a wide range of styles. When back home, he obtained a Brettannomyces culture from a US lab and tried a brew with it. He added cherries and took it to the Brewmasters Festival at the Plaza of Nations, where only one person recognized the Brett character. However, it was not until the mid-2000s that Iain brewed his first batch of Oud Bruin, a beer he was to become famous for. In 1996, Iain was visiting his friend James Walton, owner/brewer at East Vancouver’s Storm Brewing. He was invited to taste some beer that had gone strange. Not an invitation you or I would have made, or accepted, but we are talking about James and Iain here. 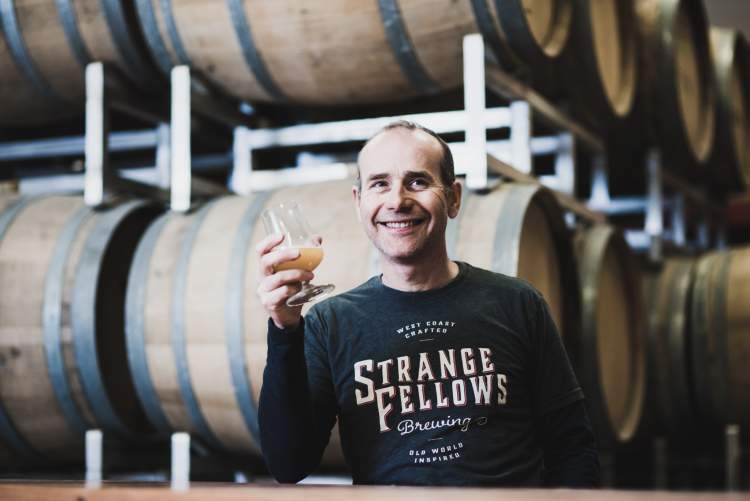 Iain said, “I think you have created something remarkably like (a Belgian) Lambic.” That was all you had to say to Vancouver’s mad scientist of brewing; it became a new direction for Walton. Meanwhile, Iain and Christine were saving to start a brewery while also putting effort into a tea company that Christine helped found. However, life was about to throw them a couple of curve balls. Many of us have been through life-threatening experiences that caused us to re-think our lives. Sometimes these come out of the blue, some are self-inflicted. Iain and Christine had one of each. In 1997, Iain was diagnosed with melanoma. Fortunately, it was caught before it metastasized, but it spurred the pair to finally tie the knot. James Walton was Best Man and they toasted with James’ new Sour Kreik. Then, in the early 2000s, Iain and Christine were backcountry skiing at Diamond Head and got caught out very late, in bad weather. On the way back, Christine had a bad wipe-out on the side of Paul Ridge. They were not sure they were going to get off that ridge alive. Like many animals, plants and fungi under stress, Iain and Christine’s response was to reproduce. Kids meant a house and a house meant no brewery ownership, for the time being. During this same period, Iain was busy helping grow the Mark James Group (MJG) into a chain of brewpubs, eventually in Whistler (High Mountain/The Brewhouse), North Vancouver (Avalon/Taylor’s Crossing), Surrey (Big Ridge) and even just down the road on Vancouver’s Beatty Street (DIX). Although Iain still looked like the young upstart (he has the Paul McCartney gene), he was gaining experience and confidence. By the time Big Ridge and DIX were in the works, Iain was stepping forward to take charge as the Mark James Group’s lead brewer. Iain designed and supervised construction of Big Ridge and DIX in 1998. This expansion begat the famed series of BC’s MJG-trained craft brewmasters. The ones Iain hired included Stefan Arneson (The Creek/Dockside, Mission Springs and now winemaker at Poplar Grove, Tony Dewald (DIX, Dead Frog, Old Abbey, Trading Post), Tariq Khan (Big Ridge and now Yaletown distillery), Peter Kistoth (later of Nanaimo’s Longwood), Mike Kelly (Nelson and Backroads), Dave Woodward (Tofino, Axe & Barrel and Mount Arrowsmith), Derrick Franche (DIX, High Mountain) and Dave Varga (now of 33 Acres). Varga would prove to be a key figure in Iain’s career, as will be explained in our story about Strange Fellows. DIX opened in late 1998 with Iain as the brewer for the first six months. It was a barbeque house, focusing on lagers to differentiate from the other brewpubs. The first brews were Light Lager (Helles), Cascade Lager (a Pilsner – no Cascades anywhere near it) and Dark Lager (Dunkel), all Iain’s recipes. Then in 2003-04 Iain set up the Avalon in North Vancouver, helping select Dominic Giraldes (later Central City, Postmark) and Hamish MacRae (Red Truck, Bridge) as assistants for new head brewer Varga. In 2010 Iain helped design a new Big Ridge brewhouse with brewer Tariq Khan. Beginning in 2007, Iain also helped design and plan the large Red Truck Beer plant. Other concurrent experiences included a stint consulting on the opening of Brasserie Trois Dames in St Croix, Switzerland and invitations to judge beer competitions in the UK and Germany. The mid 90s through the early 2000s was the heyday of the brewpub in BC, where different styles were being tried and tested on increasingly knowledgeable consumers. As Iain recalls, their brewers could put out a short seasonal or one-off without the hassle of packaging, marketing and dealing with the BC Liquor Distribution Board. Consumers could also more directly influence the brewers. It is likely that BC breweries wouldn’t have had the courage to expand their range of styles back then if it weren’t for the impact of brewpubs on the craft beer scene. Iain was right in the thick of things as lead brewer for the Mark James Group. Why did he stay with MJG for 19 years? Mark James could be a hard-nosed businessman but he paid well, and Iain was mostly left alone to develop his craft. When MJG’s executive chef Darryl Frost decided to open a startup called Central City Brewing, Iain flirted with moving. But with a mortgage and three kids, plus the dream of owning his own brewery one day, he passed on the opportunity (which went to Lohin). He was generally enjoying creating the new breweries and, starting 2010, the Yaletown Distillery. Iain is an animated raconteur when you get him going. but his eyes really lit up when the distillery was mentioned. “Other than the fermentation, I had to learn it all from scratch”, he said. Iain had pitched the distillery concept to Mark James years earlier, but often the best ideas must await their time. Okanagan Spirits had started operation in 2004, Pemberton Distillery in 2008, but craft distilling was still in its infancy in BC, so as Iain recalled, “Unlike with brewing, there were not a bunch of peers for me to talk to.” It was a steep learning curve. Iain’s first batches employed wort from the brewery two doors down, so he ran a hose down Hamilton Street to get it. He was particularly proud of his ideas around the vodka distilling process that reduced “sweet” aroma and made for an old-world flavor. He also created a gin recipe after a substantial amount of trial and error. However his pride and joy was Pear Eau de Vie, based on Poire Williams and using Bartlett pears. Iain loved distilling, but he handed over the reins to Tariq Khan in 2014, shortly before leaving the Mark James Group. Iain was not one to seek the rock-star status that other long-established BC brewers have achieved within BC’s craft beer community. Even when Oud Bruin took The Alibi Room by storm, he remained relatively unassuming. With stable, lucrative employment that was fascinating to him, and a growing family, why did Iain leave MJG after all those years? The dream. And that leads us to the story of Strange Fellows, next.